1. my parents. really, i could write a really long list of the things they have done for me and how they have been there for me over the past 31 years, but that would take several blog posts to adequately describe. i am just thankful to have such amazing, generous, God-fearing, loving people as the ones God chose to be my parents. they are great advice givers. they would give you the shirt off their own back they are so generous. they have me and my siblings families over every sunday for lunch for the past forever amount of weeks... buying all of us and our kids food every week. buying food for my growing boys is an amazing thing in and of itself. they are fun to hang out with. they have taught me so much about the Lord both in the way they live and by instructing me and giving really good advice. they are really amazing grandparents to my kids and nieces and nephews. i don't like to ask them for help often because i know they would literally give to me so much that they would make sure i had enough even if that meant they did not have enough... i hope i can be just like them in their generosity. 2. music. i am not talking about the generic term music, but i am specifically talking about the degree i have in music and the skills my parents sowed into by years of paying for private lessons for me to be able to now teach private piano lessons. music has been an amazing way to supplement our missionary income and because i have both skill and a degree to back it up, it pays really well an hour so i don't have to work very much with 4 kids and one being a newborn to make some supplemental cash. it has been such a blessing in our lives. 3. an exersaucer. it is a baby toy gym kinda thing and let me tell you it is priceless. i know they are pricey up front, but it is one investment/gift idea i have told new moms that will get plenty of mileage out of. my kids have all loved being about to stand before they are able to stand and play with all the fun toys around the circle. 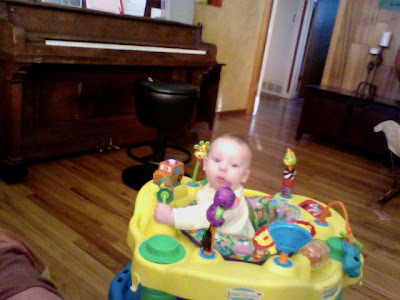 the exersaucer is how i am able to blog right now. 4. my piano. it was given to me by the husband of my childhood choir director who died of cancer about 10 years ago. this is a beautiful piano. it is a turn of the century upright baldwin which is both a beautiful instrument and piece of furniture. it has brought much music and joy into my home. thank you patty! you are loved and missed and appreciated every time someone sits down to play your beautiful piano. 5. holidays. life is so busy and with 4 little boys running around and keeping me up at night, it is seldom that i slow down from the busy pace of life to just enjoy all that has been given to me by God. i love the occasions to enjoy family, the food He has provided, the change of seasons, and take the time to really reflect of all we have to be thankful for. what are you thankful for today? i would love to hear the ways God has blessed your life below. so... what is it that we do?